Keeping your hardwood floors in good condition is not difficult, but there are a few things to keep in mind. Hardwood floors need to avoid standing water and scratches. Clean up spills and water immediately. Keep plants contained in waterproof containers or trays to avoid spillover. Entrance mats, both outside and inside, help keep floors clean and free from tracked in moisture and dirt. Scratches result from sliding furniture around; dust and dirt under rugs also contributes to scratching. Use felt or silicone pads or install casters on furniture that is moved frequently. These are available inexpensively and can be applied to nearly all furniture. Vacuuming or microfiber cloths and floor dusting mops keep dirt, dust and grit in check. Be sure to vacuum and dust underneath rugs regularly, and be mindful when sliding anything across the floor. 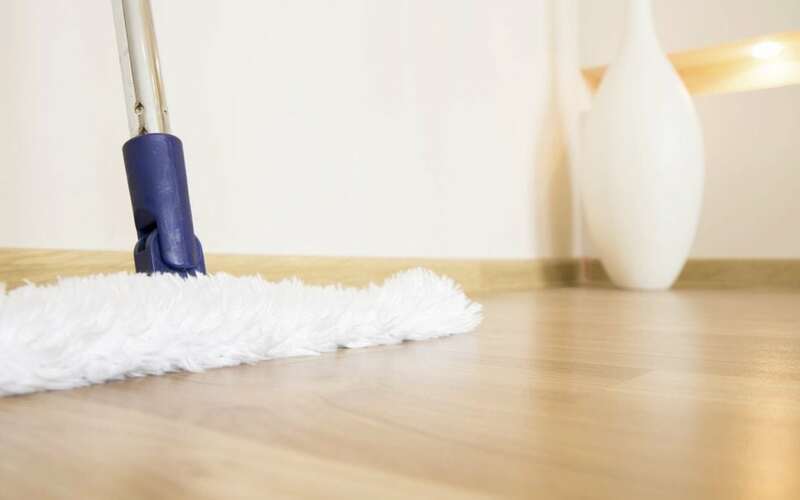 Sweeping or vacuuming and dusting should be done often, and very thoroughly before mopping, as grit and dirt in wet mopping can cause scratching. Wet mopping helps remove residues and scuffs, but above all, avoid standing water. Wring out your mop as much as possible, and if water remains after washing and rinsing, go over it with a soft clean towel or microfiber cloth over a dust mop to remove excess moisture. If you prefer natural cleaners, vinegar and water (one cup vinegar per gallon of water) is a good solution to use, but keep in mind, if they are waxed, this cleaner may remove some of the wax finish. Spot cleaning with a paste of baking soda and water applied with a cloth or sponge can help remove scuffs and stains. Never use harsh abrasives or bleach on floors, they can ruin the finish. Also, avoid wood polishes, as they can cause buildup and leave floors slippery and unsafe. For wet mopping, most professionals prefer a specialty wood soap such as Murphy’s Oil or a brand recommended by your flooring professional. How to perfectly clean your hardwood floor on Thanksgiving? How to repair a hardwood floor?